Every couple of weeks I am fortunate enough to take a few folks out where I work to go bird watching. 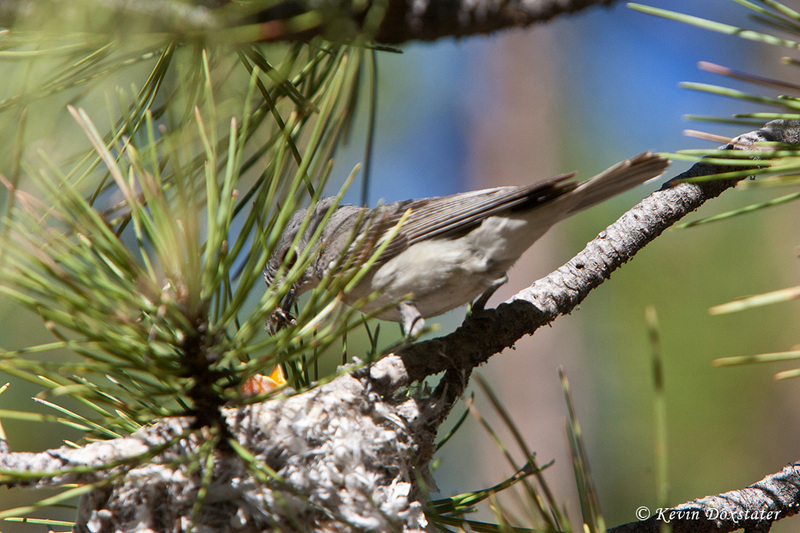 Plumbeous Vireos are always a good catch, though they are frequently heard but difficult to find high up in the pines. Expecting the typical stick and twig construction, what we found looked similar in many ways to a hummingbird nest, only MUCH larger. Bits of plant matter held together with spider webs, it was only about 7 feet above the forest floor. 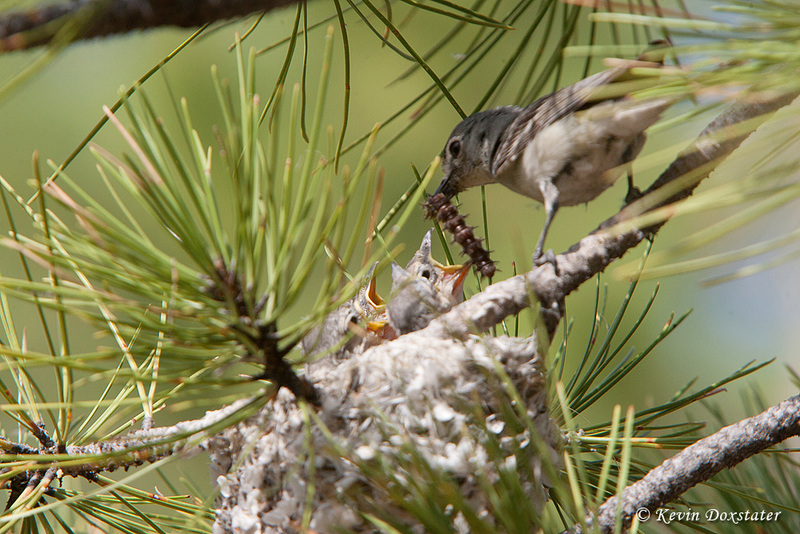 I couldn't get back for a couple of days, but found the parents feeding their newly hatched chicks regularly - note the yellow-orange bill, just barely visible, reaching up for a fresh, juicy bug. 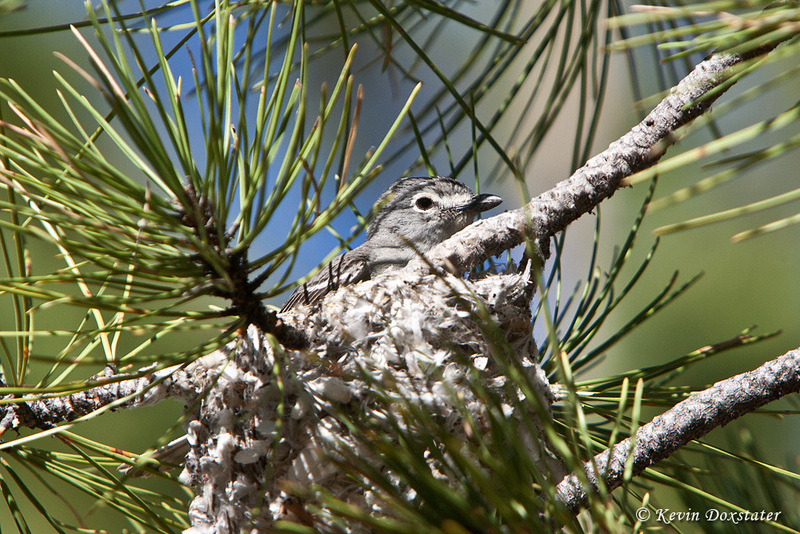 The nestlings must have been pretty small and unable to self-regulate their body temperatures at this stage as an adult would sometimes sit on the nest. It would be another five days before I could get back again, and the young ones were really growing fast, the adults were working feverishly catching insects and bringing them back to the nest. Two days later (July 4), the feeding continued, here the parent bringing what appears to be a moth . . .
. . . followed a few minutes later by this huge caterpillar! Later that afternoon I returned with my video camera in hopes of getting a little video to go along with the stills, only to find the nest was empty. 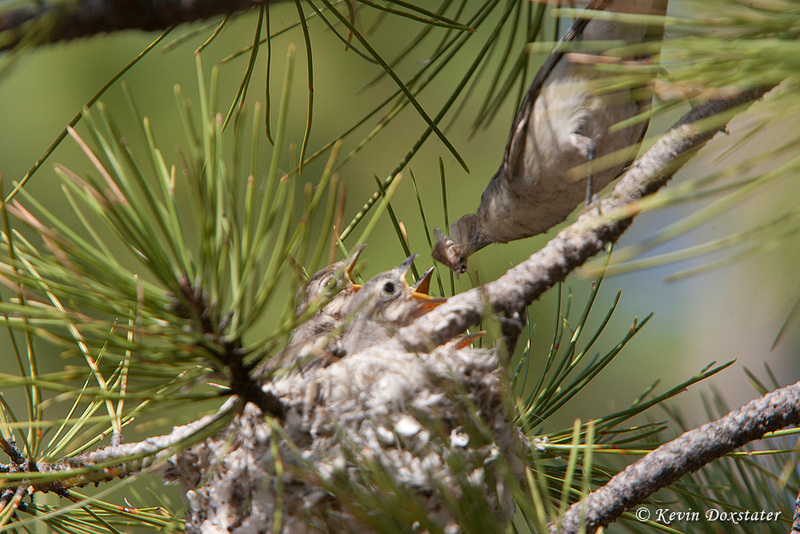 I could hear the adults calling and, softly, the now fledgling Plumbeous Vireo chicks begging. Though never completely certain, I thought there were four in the nest, but could only find three as I followed the sounds they were making. One thing that took me by surprise was that they were not together, unlike other fledglings I've seen. I plotted their locations with GPS coordinates and Google Earth as you can see above. I found them to be anywhere from 50 to 90 feet away from the nest and well separated from each other. It would be interesting to know if this is normal strategy and, if so, for what purpose. Is it to increase survival rates by reducing the chance of all being taken by a predator, or to reduce competition from siblings for the parent's attention for food? I hope to find out . . . I did get some video, too. 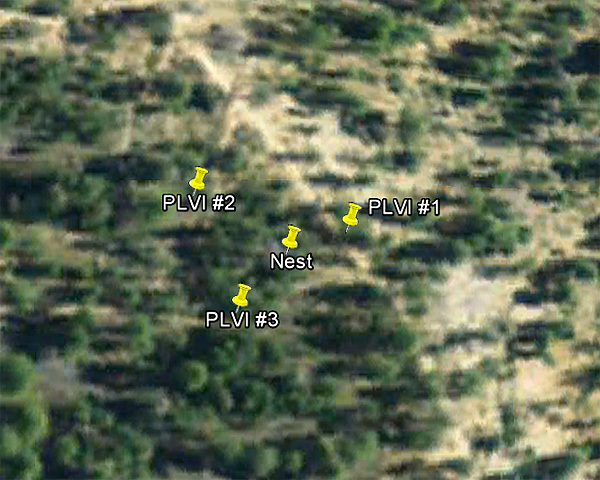 This is PLVI #1 on the map above, who I found in some brush very close to the ground next to a busy hiking trail. It'll be in a tree toward the end of the clip, as I chose to get it up a little higher and away from people. Truth be told, the adult was scolding me rather harshly when I first picked the chick up, but calmed down and began singing, rather sweetly actually, after I placed it in the tree and backed away from the chick. Another thing about the video is to note how stubby the wings are - they couldn't fly much, but did hop from branch to branch while flapping their wings. Their gone now, though the last time I saw them they were still not flying all that well, but moving from tree to tree following the parents around. All in all a great experience for me, and here's hoping they live long and productive lives . . . Very cool experience and interesting observations Kevin, accompanied by great photo documentation. Great post! Fantastic photos and very informative. Enjoyed the video. Interesting series and well photographed. O lugar ideal para nascer, alimentar, e viver. What a fascinating nest! Lovely images Kevin, it must have been amazing to follow this family and the chicks growth. What a wonderful experience for you. Very cool nest. 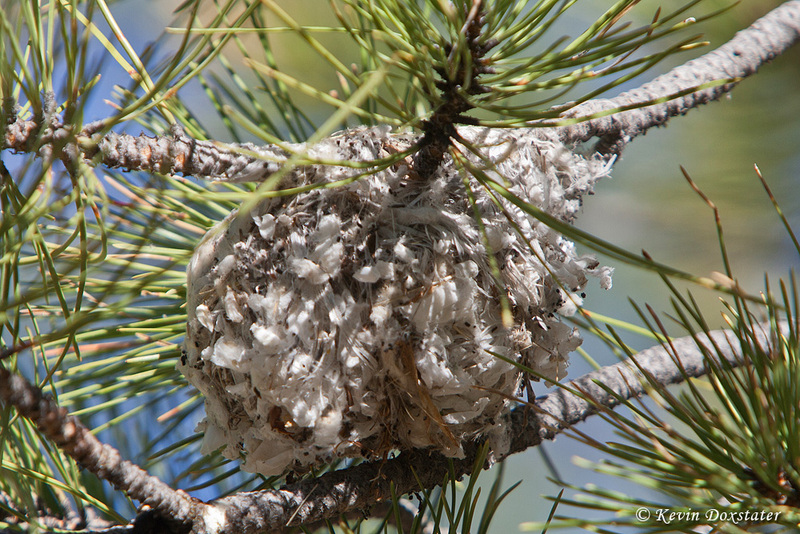 It really does look like a extra large hummingbirds nest. Outstanding documentation! Thanks everyone - it really was a great experience! Funny, because now I've heard adults calling in other areas and am in tune with the begging call of little vireos, and so now know there are many more of them around. A most excellent post Kevin! 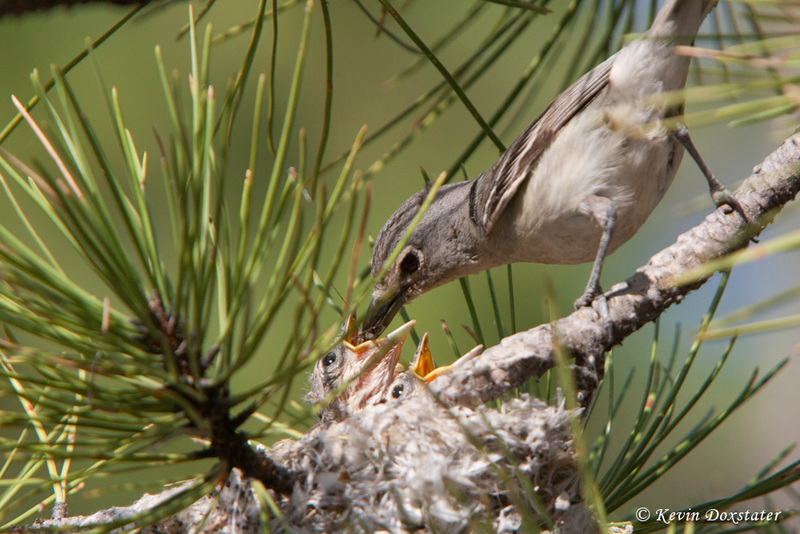 I love the shots of the chicks in the nest and the parents with the various food items being brought in. Great documentation of the nesting and the video of the begging chicks being fed is the real topper! According to Birds of North America Online, "Young and adults initially stay in the vicinity of the nest, and are often observed within 200 meters of the nest at least 2 weeks after fledging. Young tend to perch separately in vegetation awaiting parental feedings. 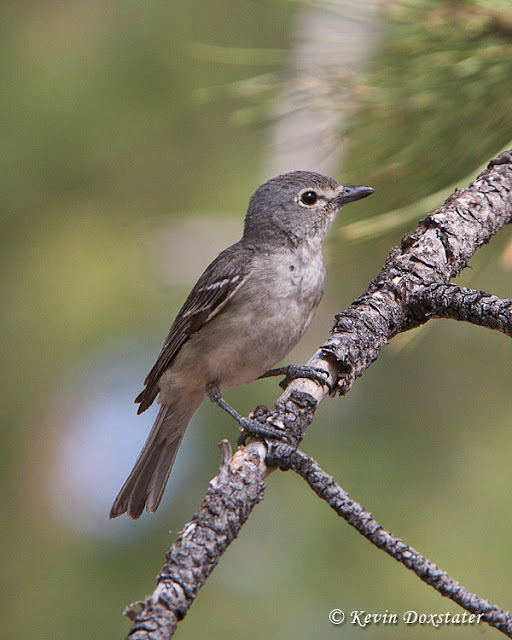 Young generally silent, except for occasional contact calls between adults and chicks, and loud begging calls emitted when adults with food are nearby." They don't state why the fledglings separate like this but it appears to be the norm. Wonderful pictures and information! Excellent post and experience. Loved the video too.